My shop is filled with mainly necklaces but I do have a few earrings. This pair is my most recent design. For readers unfamiliar with that symbol smack in the middle of the discs, it is the symbol for Om. How do I explain the meaning of Om? I needed help from Wikipedia. 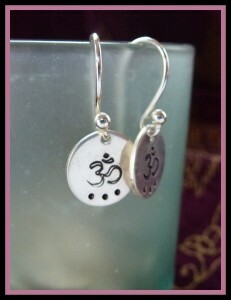 Lets just simplify and say that Om is the sound of the vibration of the universe. I heard Om recited by my parents a gazillion times while growing up—I always associated it with my religion and prayers. When I took up yoga more than a decade ago, I started hearing it during some of the classes. Odd, I thought—Om belongs in my home with my parents or in the mandir. I’m over the oddness now. I’m here in California, in a city by the bay. I haven’t managed to replicate some of my childhood experiences for my kids to enjoy. And I have a feeling I won’t be getting to this one anytime soon.